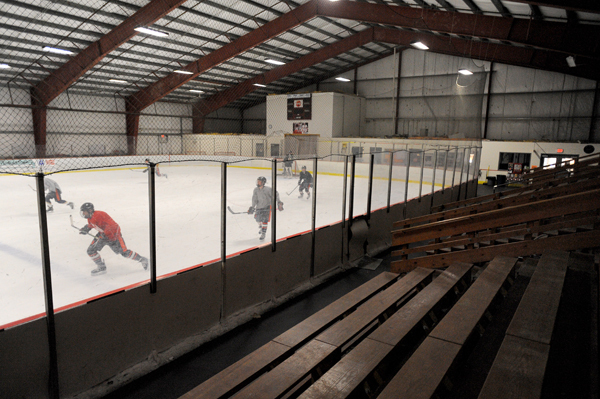 BREWER, Maine — The Brewer High School hockey team is among the state’s elite. The Witches, 12-1 and leading the Eastern Maine Class B Heal Points standings, are 122-20-5 over their last 147 games. That includes two state Class B championships, three Eastern Maine B titles and two Class A semifinal berths. But their 16-year-old home rink, Penobscot Ice Arena on Acme Road, strikes a raw nerve with local coaches every day, primarily because of continuing safety and health concerns. There is at least one pronounced V-shaped gap on the boards near the Zamboni room. “Then you have the locker rooms,” added Hale. “We live in a community that is very concerned about staph infections and cleanliness and that facility is an absolute breeding ground. “It’s embarrassing,” said Hirsch, who also noted a concern over players contracting the staph infection MRSA. “They have improved some things and let other things go,” said Flynn, who observed that the ice surface has been better in recent years. “The things they’ve let go aren’t things the average fan would notice. It’s the behind-the-scenes stuff,” added Flynn, who said that his players complain about playing at the arena. Roger Theriault, the Lewiston funeral home director who owns the rink, was disturbed by the allegations and said he wished the coaches had contacted him about their concerns so he could have addressed them. Randy Marsh, the first-year rink manager, said one of the problems is that some of the visiting teams, including teams at all levels, ransack the locker rooms. And Marsh is the only full-time employee. There are a couple of part-timers. Sawyer Arena in Bangor has six to eight workers. problematical for hockey players and figure skaters. Theriault rescued the rink from foreclosure and an auction sale in 2001 as he and his Delta Hockey LLC assumed $870,000 in debt from mortgage holder Bangor Savings Bank. Lou Janicki, Theriault’s brother-in-law, built the rink in 1996 and managed it for several years. Theriault is quick to point out that unlike Sawyer Arena, which is owned by the city of Bangor, and Alfond Arena, which is owned by the University of Maine, Penobscot Ice Arena is privately owned and he simply doesn’t have the money to invest in a major overhaul. However, he is trying to secure a loan in the vicinity of $25,000 to improve the four locker rooms by insulating them and installing heating units. He also said if people in the community would be willing to contribute the labor, he could take that to the bank and possibly secure a loan in the $48,000 range. He would pay for all the materials. He said the most consistent complaint he receives is about the cold air inside the facility. One possibility, he said, is to install portable coin-operated heating units that fans could use during games to heat their sections. Brewer City Manager Stephen Bost and Brewer fire inspector Ralph Cammack have heard their share of complaints about the facility. Cammack and Code Enforcement Officer Ben Breadmore recently inspected the facility and issued a list of code violations that had to be addressed. Cammack said they have to update the maintenance on the systems used to test the sprinkler and fire alarm systems, replace a lot of emergency lights, fix the latches on the exit doors, replace plumbing caps in the locker rooms and repair the electrical panels. “Everything can be fixed relatively cheaply,” said Cammack, who will meet with Theriault on Tuesday to inspect the improvements. “They’re minor issues,” said Breadmore. Bost pointed out that Theriault is behind on his tax payments, his sewer bills and the parking lot lease money. But he said Theriault has always paid his bills in the past. He owes $11,000 on his July tax bill, $1,138 on his September sewer bill and $5,000 on the parking lot fee. Theriault said those bills arrive during the off-peak times and he will pay them as soon as he receives his payments from his two primary tenants: Brewer High School and Hampden Academy. Bost said the Brewer isn’t interested in purchasing the arena, which is what Bangor did with Sawyer more than 20 years ago. The former owner of The Colisee ice arena in Lewiston travels to Brewer at least twice a month, he said. Brewer coach Dave Shedd and Hampden Academy coach Bill Schwarz said they are thankful for having an ice sheet to practice on. In addition to the high school and youth hockey teams, there are 14 men’s league teams and the facility is one of the few rinks that is open in the summer. “It provides a lot for so many different organizations,” said George Bishop, vice president for instructional skating for Brewer Youth Hockey. “There aren’t any structural problems. It just needs money and elbow grease,” said Flynn. “I’ve been skating on it since I was 3 years old. It’s my home [rink] and it always will be until I don’t play hockey anymore,” said Brewer senior left wing Jacob Chapman. “It’s getting better. It’s not the best rink out there, but it’s our rink. It is what it is. We deal with it. It just needs more care. Senior right winger Tyler White said it gives them a decided home-ice advantage. “That’s probably why we’re such a good team. If you practice and play in this rink, you have an advantage over any other team that comes and plays here,” said White. But White feels they deserve better. “But we’re grateful for what we have,” said White. Marsh and Mike Kane, who ran the rink for three years before returning to Sawyer Arena in July, said Theriault is a good person who cares about the facility. “Roger is a good guy and he has a plan for the rink. It’s just going to take time,” said Marsh. John Duff leased the facility for two years and dumped a lot of money into it. He almost bought it in 2009, but the deal fell through at the last minute. Theriault, who had intended to sell the facility to Duff for $1.15 million, said he doesn’t have the facility and its land acreage on the market now because, when he did, he used to receive so many ridiculous offers. However, he said he would be interested in selling if somebody makes the right offer. Hale said Duff did an exceptional job upgrading the facility.